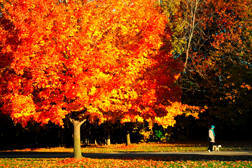 Fall is a great time for a walk, and Greater Lansing is full of inspiring locations. 1. Michigan State Campus - Yep, this one gets the top ranking. Sure I&apos;m a Spartan, so being on campus fills me with good feelings, but its an incredibly beautiful campus for everyone come autumn, even if you&apos;re a fan of that other school south east of here. 2. The Lansing Rivertrail - This is a gem of a rivertrail that offers all kind of scenic views as it winds through town, from East Lansing to downtown, through the zoo... and beyond. 3. Woldumar Nature Center - Tons of trails, cool and unique environmental settings and peaceful quiet moments abound. Ahhh. 4. Fenner Nature Center - Fenner has a huge pond I love to watch, but this is also a solid place for a great fall walk. 5. Harris Nature Center - This place is great. Last time I was there walking I saw two deer, a dozen turkeys, a hawk... and a partridge in a pear tree. 6. Beal Botanical Gardens - I know, I know, I already said MSU, but this is different. MSU Campus is stellar on its own, but its Agricultural heritage gives this campus world-renowned gardens to explore. Beal was started in 1873 and has been a place for a walk and deep thoughts ever since. 7. Hawk Island Park - One and a half miles of paved and accessible walkways as well as fishing docks and a playground make Hawk Island a place to come for a walk, and then stay for some more fun. 8. LCC&apos;s Shigematsu Memorial Garden - This is more of a place to go for a stroll. It&apos;s not huge or anything, but there is plenty to see. Japanese maples and cherry trees surround clear shallow ponds full of colorful fish. 9. Frances Park - This place is a gem, especially if you&apos;re a fan of roses. Get out there for a walk in early fall and treat your senses to a gift like no other. 10. Sleepy Hollow State Park - Can you think of a better name for a park to hang out in this Halloween season? Stay until dusk and picture the headless horseman chasing poor Ichabod Crane through the woods. Tons of space for an amazing fall walk then wet your line and maybe pull up a bass. So that&apos;s it folks. The best places in Greater Lansing for a stirring and inspirational fall walk in the wilderness. If you want to learn more, or investigate other spots not mentioned here (there are a lot more, I&apos;m telling you) go to the parks and gardens section of this website. http://www.lansing.org/visitor/things-to-do/parks-gardens/ Get out and take advantage of these amazing surroundings before the ground becomes white, the holidays storm in upon us and the only walking you&apos;re doing is from store to store at the Meridian Mall.